Freshly (bought) and installed Synergy, with the hope of setting up my Win7 machine as server and Debian machine as client. I ran into a few problems getting the Debian machine to be recognised as the client but that is a separate issue that I think I have figured out how to solve when my current problem is solved. I read from previous posts that having a "-" in a screen/host name can cause problems in Synergy, so I changed my Win7 (server) machine's name so that it does not have a "-" in it. 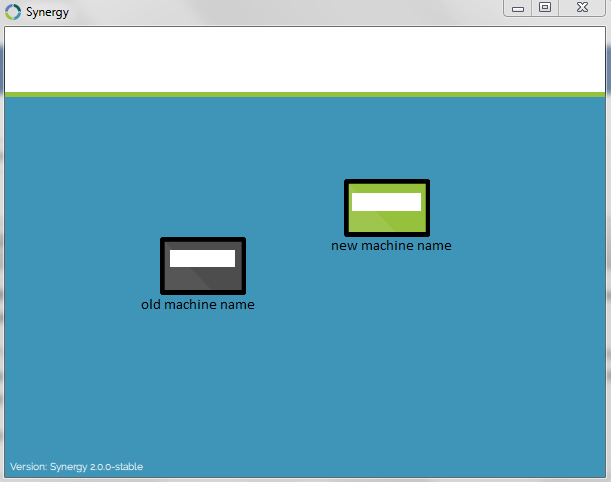 However, when I relaunched Synergy, both the new machine name and old machine name appear in the window. I have tried multiple times to edit the config file in AppData to get rid of my old machine name but it won't budge. Every time I relaunch Synergy the edited config file gets overwritten and the old machine name gets put back in. I have tried uninstalling Synergy, deleting the config files, the registry keys and reinstalling but the same thing happened. Looking at the log files, Synergy now thinks they are 2 separate machines. Attached is a picture my Synergy window. The software downloads the config from the cloud, ergo writing over your local changes. Also the ability to rename/ remove machines is not yet available. as it's a new name I assume it thinks it's a new machine and added it. I currently have three computers when I'm only using a 2nd mac in place of my mac mini that's not online right now. Ok, I've just buy a new computer. I installed synergy 2, then finally, I rename it. So what, I won't be able to use Synergy on it anymore ? I uninstalled Synergy and install it again, but nothing change. The new computer has changed its name and synergy UI tell 'There was a problem connecting to the autoconfig service". My second computer only display the old name of my new computer. Is there a way to make it work again ? I did the exact same thing install new OS had default pc name. Installed Synergy 2.x, Then renamed PC once rebooted Synergy has both the old name and the new name on the screen. Once you install 2.0.5 you can right click on the machine and delete it. Simply it is not possible to change PC name once it has been assigned. after clean install of windows 10, you need to change PC name to the desired one before installing synergy as it has no function to change or delete the PC shown on screen. Synergy team, please fix as soon as possible as it should be be able to name, rename anytime we wanted to. picking up the screen name for one but cant rename is so annoying after a while. Considering that people has to pay for the product, you need to make the product fully functional. Are we talking about Synergy 2? Otherwise, I'll be happy to help you in this forum post. I've created a support ticket. Synergy 2 hasn't been updated in months.